Mapmaking 101: Map of Suzhou, China — Root & Branch Paper Co.
Hi everyone! 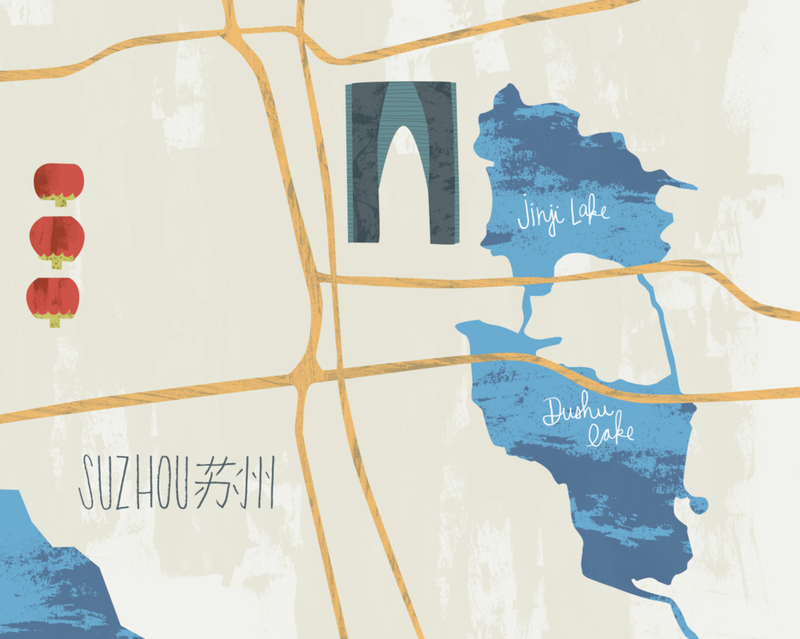 Today I’d like to show you a peek behind the scenes of a recent project I’ve been working on… an illustrated map of Suzhou, China. I have challenged myself to expand my horizons as an artist, and in doing that I decided to create this map of Suzhou. Suzhou is an ancient city in China, very close to Shanghai on the coast. Known for its classical Chinese gardens, ancient canal streets and temple pagodas which now exist alongside skyscrapers, flashy shopping malls and ritzy developments. Home to 6.9 million people, Suzhou is a gorgeous city full of culture and history, as well as a LOT of new growth. I’ve been living here for over 2 years, and it was an absolute thrill to turn this beautiful city into an illustrated map. To fill in the map, I used some of my favorite spots in the city as well as my university. Since most of my friends and family haven't made it to China (yet!) I wanted to make this map communicate the feel of this wonderful city to western audiences without making it into a stereotype. I ended up not using several icons, plus quite a bit of the lettering I made for the roads and metro lines because it felt too cluttered. I also wanted to include the Chinese characters for the names of the icons, but again... too cluttered. Might have to make a Chinese version! Here's a screenshot from early in the process... about halfway in I changed my technique for illustrating the icons to give a more hand-drawn feel to the end result. I’m happy with the style of this map and I hope to make more. I’d like to create one for each of the cities I’ve lived in, or maybe some of my favorite cities I’ve visited! So there we have it! A behind the scenes look at how I created this city map of Suzhou, China. What city should I illustrate next?